Happy National Cheese Lovers’ Day! As if I needed an excuse…. 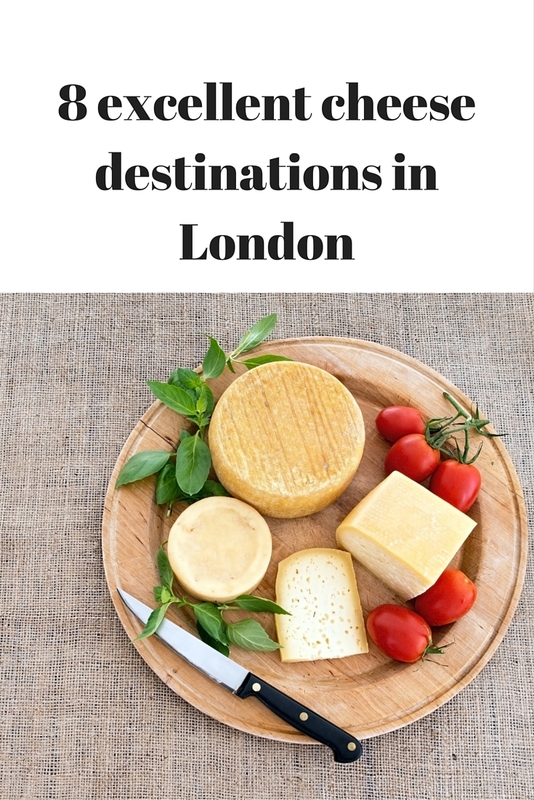 …my adoration of cheese is well-documented, and living in London I am lucky enough to be surrounded by destinations for enjoying dairy based fare. Please enjoy this list of tend of my top destinations in the capital for turophiles. An amazing cheese shop, plus a delightful bar (the fondue is amazing! ), this is an east London fixture. This London outpost of the Parisian fromagerie par excellence is always worth a visit. The hampers also make wonderful gifts; I especially like the ready made cheeseboards, perfect for entertaining! The smell alone would have me recommend this place to you all – as soon as you enter you are greeted with the most wonderful aroma of gorgeous cheese. I have had some amazing Bleu des Basques and Rocamadour from here. Their events are meant to be amazing, I’m hoping to get over to west London for an evening before long. Whenever I pop over to Victoria Park (more often in the warmer months, I must confess! ), I’m sure to visit the Deli Downstairs. There’s a great range of goods to choose from, not least the brilliant cheese selections, perfect for composing a charming cheeseboard. A marvellous cheese shop and a fantastic little cafe adjacent to the store as well. If you wish to make your mouth water, do click through and enjoy the alphabetised list of cheeses available. There is a shop in Highbury as well, but I have yet to visit. One of my favourite bars in the city, not least for its excellent cheese selections (I adore the Saint Nectaire, the Gorgonzola and the Dambuster as a trio). Pull up a chair, order a gorgeous bottle of wine, and fill a plate with fresh, crusty baguette, beautiful cheese and chutneys galore. One of my favourite treats in town. A darling of the cheese scene in town, serving up slices and wedges of the most delicious cheeses. As well as the Covent Garden shop, there are also locations in Bermondsey and Borough Market. One of the oldest cheesemongers there is (established in 1797), and good enough to have a Royal Warrant from both The Queen *and* the Prince of Wales, Paxton and Whitfield is truly a London gem! A membership to their Cheese Society is firmly on my wishlist, with a monthly delivery of a dairy delight, four cheeses picked to be enjoyed at their best. Some of the best Stilton I’ve ever enjoyed came from here. A lovely little cheese shop in Pimlico that’s been in business for just over 25 years, selling around 500 varieties of delicious cheese – if you need it, they’ve probably got it! I love perusing their stock whenever I find myself over in that part of town. Writing this post has left me both famished and desparetely craving some cheese – I hope you’ve found some turo(phile)-iffic inspiration here. Where are your favourite spots for the best cheeses? Exactly my initial reaction when I walk in there! Cheese is the best! I really like DeBeauvoir Deli in Islington/Hackney, they do some lovely things. I could probably just wander round the delis of London for hours!